Where are we making real advances in geophysical technology? Data acquisition: High power ultramanouverable Vibroseis - broadband sources and recording - seabed node recording - super sensitive recording devices - wireless recording - permanent seismic recording with fibre optics on the seabed and in wells - just some of the new geophysical technologies. Data Mining: using Analytics to pull insights from data bases that are too large for humans to analyse. Modelling & Inversion: we are seeing real advances in the integration of conventional (3D) seismic data with other geophysical measurements such as gravity (FTG), electro-magnetics and multi-component seismic. In addition, it looks like there is real progress being made in the rule-driven inversion of seismic, perhaps even offering 'automated' inversion, maybe reducing the call for conventional interpretation? There's a lot going on; how do you choose where to invest your time, energy and money? 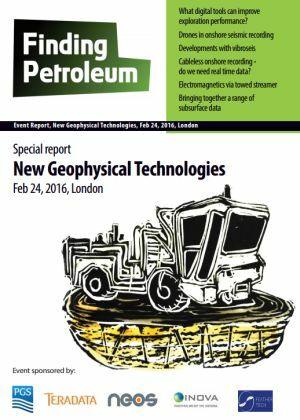 Our Finding Petroleum forum in London in February 2016, "New Geophysical Technologies", presents the best of the new technology, and the latest thinking in how to use it. We subsurface folk need to "up our game". Not only has Exploration not delivered globally over the last 3 years or more but now we have to find low cost oil & gas resources. This latter point undoubtedly moves us towards the onshore, perhaps especially shale oil or gas. And promts a number of technical questions for we geoscientists:What contribution can 'Big Data'/Analytics make? How do we transform onshore seismic to be more like - and even as inexpensive as - regional offshore 3D? What other geophysical techniques can help - non-seismic as well as for example 3C seabed seismic? Given this potential diversity of such measurements - multi-measurements indeed - how do we integrate them? I will present a novel tripartite approach to thinking through the 3 components of sub-surface geoscience which I define as 'Big Data'/Analytics: Rule-driven Interpetation: Inversion & Modelling. PGS’ Towed Streamer EM technology enables the simultaneous acquisition of high density marine Controlled Source Electromagnetic (CSEM) and 2D dual-sensor GeoStreamer data. Acquiring two complimentary geophysical datasets from a single vessel is not only highly cost effective, but also saves time in the context of increasingly brief exploration licenses. This acquisition efficiency has resulted in a step change in the marine CSEM market; significantly more densely sampled EM data can now be acquired in a dramatically reduced timeframe. It is this density of data which enables the detailed integration of the seismic and EM; resulting in higher resolution resistivity data and enabling truly innovative workflows to be refined. Towed Streamer EM data, when interpreted and integrated with seismic offers oil companies the ability to significantly de-risk frontier acreage, characterise specific prospects, extend asset life through effective near field exploration and even estimate levels of gas saturation. Data Science versus Geoscience in E&P: "And", not "Or". NEOS takes a phased approach to multi-physics interpretation and integration, relying heavily on, airborne non-seismic measurements, seismic data and predictive analytics to identify resources in the subsurface. Three recently completed case examples - high grading acreage in Neuquén, Argentina, mapping regional prospectivity in Lebanon and identifying G&G measurements and attributes that correspond to the best producing wells in the Denver-Julesburg (D-J) Basin, Colorado - demonstrate the benefit of NEOS’ multi-measurement methodologies for E&P companies and governments.